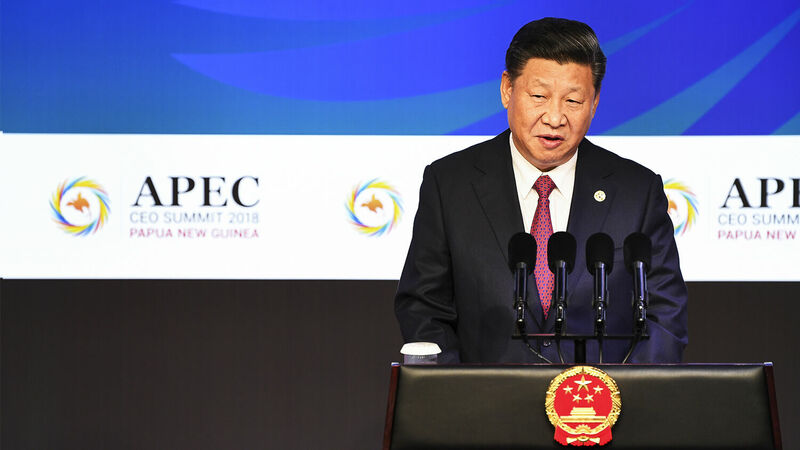 Chinese President Xi Jinping speaks at the apec Summit on November 17 in Port Moresby, Papua New Guinea. The Asia-Pacific Economic Cooperation (apec) summit ended without any agreement on Sunday. Despite the gridlock, this 21-nation forum, which includes the United States, China and Australia, was a major political victory for China. Divided and disgruntled members walked away without an official declaration. Beijing and Washington had descended into a war of the words over proposed changes to the World Trade Organization. Despite the deadlock, Beijing walked away a winner, further cementing itself as the regional powerhouse. This year, apec was held in the mountainous, resource-rich nation of Papua New Guinea. Despite its vast resources of timber, fish and mineral wealth, Papua New Guinea is poor. The gross national per-capita income is a meager $3,403. Income inequality here is the highest in the Pacific. Outside of Africa, it ranks the lowest on the United Nations Human Development Index. Weak government and institutionalized corruption undermine national sovereignty. This leaves the nation ripe for Chinese exploitation. The world is slowly waking up to the danger of China’s debt-trap economics. In a nutshell, China bankrolls major projects for smaller nations. Happy to accept the investment, but unable to pay back the loans, nations are often forced to hand over control of the project or facility to China. Debt becomes a weapon whereby China seizes ports, railroads, factories and airports. The Pacific is full of examples. Even Australia, to a degree, has fallen for the ploy. The United States and Australia are attempting to counter Chinese offers with deals of their own. Australia far outgives China in terms of aid. But there is a difference. The aid of Western nations comes with strings attached. For instance, Australia gives money for only what it deems as sound projects: investments for the betterment of the economy and for bilateral relations. China is far less scrupulous. In the lead-up to apec, Beijing sold Papua New Guinea 40 custom-made Maseratis and three Bentleys. The Maseratis retailed at well over $200,000 per car. The kicker is, the vehicles weren’t even used for apec. Most dignitaries used armored transport. Beijing also rebuilt the showcase convention center, and gifted coaches, minibuses and fire engines to the government in Port Moresby. The expected bill will be in the tens of millions of dollars. China also built a six-lane “road to nowhere.” The 1-kilometer avenue spans from the parliament building to a nearby local road. It cost $16 million. Ironically, it is named Independence Boulevard. Nothing could be further from the truth. Such reckless deals ensnare and enslave the country. Papua New Guinea’s national debt to China is the largest in the Pacific, stacking up to $590 million. In response, Australia poured more than $86 million into this year’s apec. Canberra budgeted $572 million this year for Papua New Guinean aid. But it doesn’t matter. If the government in Port Moresby can’t repay the debt, Australia won’t demand the nation give up its sovereignty—China will. Australia and the U.S. see Beijing’s tactics at work. The Western nations have already promised funding for a naval base in Papua New Guinea. China had also previously expressed interest in the project. The Lowy Institute estimates that from 2006 to 2016 Australia dedicated $7.7 billion in aid to the region. China dedicated only $1.7 billion. Even so, it is China that is taking control, not Australia. According to Chinese State Councillor Wany Yi, China has built more than 100 projects in the region. These projects are coercing, or forcing, Pacific nations—one way or another—into China’s Belt and Road Initiative. During apec, China pitched the initiative to eight member nations. Tonga signed up on the spot, earning a reprieve from debt repayments to Beijing. Meanwhile, U.S. Vice President Mike Pence pleaded with nations not to fall for the debt trap. His pleas didn’t fall on deaf ears, but hostile ones. “I was just pleased with the message from the Chinese president. I thought his views better represented how we feel,” Papua New Guinean Treasurer Charles Abel told Reuters. Of course, who wouldn’t side with the nation handing out “free” Maseratis and Bentleys? Australia and America can no longer outgive China. Nor is the West willing or able to use its generous aid packages as leverage against China. The unscrupulous “gifts” from Beijing are too enticing for the impoverished island nations. At the end of the day, the West is up against Bible prophecy. China’s rise, its economic power and its powerful trade alliances are all outlined in the pages of your Bible. While the specifics of how are not expounded in scripture, the end result is. This mart of nations is not a peaceful economic alliance. Look at the prophecies in Revelation 9 and 16. China is pictured as part of another end-time conglomerate, and its rise would not only be economic, but militaristic! The meaning behind Revelation 16:12 and 9:16 is outlined in the following 90-second video. Notice that China helps field a 200 million-man army! China’s Pacific policies are helping steer the world toward a trade war, and even nationwide besiegement! And it was all foretold in Bible prophecy. As disturbing as these trends can be, there is incredible hope as well. Jesus Christ foretold that the world would come to the brink of annihilation before His return. But Christ also promised protection for those who heed world events and repent. These few will be found “worthy to escape all these things that shall come to pass, and to stand before the Son of man” (Luke 21:36). Are you watching and heeding? If you would like to read more about China’s rise, and the vitally important reason why God is allowing it, we have an in-depth Trend article that may interest you: “Why the Trumpet Watches the Rise of China As a Superpower.” Now is the time to sit up, take note, and take action.